Great Tythe Barn is a luxury four bedroom, three bathroom semi-detached cottage on two floors for up to 8 people. It has a well equipped and fitted pine kitchen with dishwasher and washing machine as well as cooker, microwave and fridge/freezer. The dining area has a farmhouse table with seating for 8. The living room has comfortable settee seating, Devonshire pine furniture, large screen colour TV, VCR and hi-fi, night storage heating and electric heating. There is a ground floor bedroom with a four poster bed, in antique style and full bathroom with both bath and power shower and a heated towel rail. The feature staircase leads to three further bedrooms - a double with canopied bed and ensuite shower room and two twin bedrooms, all with pine furniture, which share a further full bathroom with bath, power shower and heated towel rail. Great Tythe is light and airy throughout with large double glazed windows and good night storage and electric heating. There is a garden are directly outside with flower beds, grassed area and garden furniture. It is ideal for the large group or family wishing to holiday together in comfort and with excellent facilities. 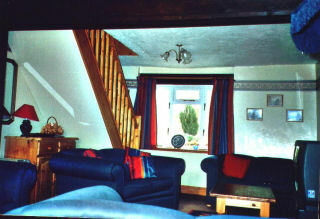 The ground floor of Great Tythe Barn Cottage can also be let, outside peak season, as a superb one bedroom cottage. Great Tythe Barn is approached directly from the drive with no steps. The living room, kitchen, one bedroom and bathroom are on the ground floor with no steps and so is suitable for partially disabled use. There are a selection of restaurants at the local pub and others just a short drive away and just over half a mile away is the nearest cove, Welcombe Mouth, with its cliffs, waterfall, rock pools, sand and surf. 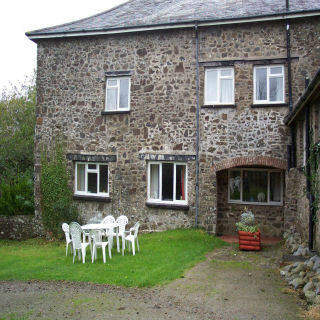 The cottage is very close to the South West Coastal Path and provide itineraries for local walks, mostly circular, through wooded valleys and countryside, along Devon's typical lanes or along strenuous but beautiful cliff paths. Riding and golf are also available locally and swimming pools are available at Hartland Forest and Bude. Inland are old-fashioned market towns of Launceston with its antiques and castle, Tamar Otter Park and Bodmin Moor. Changeover day is Friday in high season, but flexible in low season. Free electricity, power, heating and towels. The cottage is available from 4pm on your day of arrival and must be vacated by 10am on your departure day, unless by special arrangement. Pets welcome (max 2) @ £20 for first and £10 per week for second. Cot and highchair free (subject to availability as they are shared between a few cottages). Reached by a narrow, bumpy track which leads to a small car park, the beach at Welcombe Mouth is a mixture of pebbles, rocks and a little low-tide sand. The valley behind the shore, carved by a stream, is a nature reserve. This was the haunt of 'Cruel' Coppinger, an 18th century smuggler and wrecker whose exploits are recalled in the maritime museum in Appledore. David Coppinger was a Dane who landed on the Cornish coast during a storm. He became a smuggler, and he and his gang terrorised the district for many years, until the revenue men made a determined effort to capture him. Coppinger escaped to a waiting ship, and was never seen again. A steep footpath runs southwards to a secluded rock-and-pebble beach at Marsland Mouth, where a stream marks the boundary between Devon and Cornwall.